Posted on June 21, 2017 , in Swim Spas. Swim spas can provide you with a variety of fitness and relaxation benefits, but they can also help you make your home more valuable to potential buyers. Below, you’ll learn about why swim spas are huge perks for people shopping for new homes and what you should think about before making the investment. One of the most attractive things about a home with a swim spa is that it makes exercise extremely convenient, which can be enticing to future homeowners with busy lives. Homes with swim spas truly set themselves apart from other homes because it’s rare for a home to have a built-in get-in-shape option. For people with kids or extremely busy work schedules, a swim spa can provide an even greater advantage. 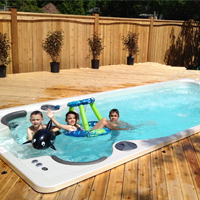 Homes with swim spas present a distinct advantage over homes with just a swimming pool. This is because many of the latest swim spas feature heated areas that work as hot tubs, adding an additional benefit. If you have a small backyard, a swim spa can be a great choice because it saves space and provides users with all the benefits of a swim spa and a hot tub while allowing them to still use the rest of the yard. In summer, many kids rush to the local swimming pool, but parents often feel safer if their kids are close enough to watch. Swim spas can also make life easier for parents as they won’t have to drive kids to the pool and can do projects and chores at home while watching their kids swim and making sure they’re safe. In addition, a swim spa also allows parents to use the swim spa with their kids during the summer months, creating an opportunity for fun and bonding. When you want to emphasize the value of a swim spa, your first step is to discuss it with your real estate agent. Because not everyone has experienced life with a swim spa, there are some benefits you’ll need to explain so they can express them to potential buyers. Gather information about maintenance, key features, and how much your swim spa costs to run, emphasizing the fact that a swim spa is cheaper and easier to maintain than a swimming pool. In addition, take the time to work the swim spa into your outdoor area in an aesthetically pleasing way. By creating a space with a deck, patio, stereo, or bar, you’ll make your swim spa even more enticing! Whenever your home is being shown, make sure the swim spa is clean, free of debris, and that the water is clear. You can keep your water in great shape by putting a cover on at night, vacuuming, and balancing the water. With these tips, you’ll be able to use your swim spa to its best ability to increase the value of your home. To find the right swim spa for your home, download our buyer’s guide.